METI has introduced a Security Gate System to enhance the security of our Ministry. (1) Go to the reception desk and show the staff your photo ID (e.g. driver’s license, passport, employee ID/student ID, press ID, credit card). If you have been given a registered number in advance, inform the staff of your number to facilitate faster processing. (2) Receive the visitor card. (1) Fill in the Visitor Request Form and hand it to the reception desk. (2) Show your photo ID and tell the reception/ security staff the division name as well as the name of the relevant person whom you would like to visit. (3) Receive the visitor card. (4) Please be prepared to show the staff the contents of your hand luggage before entering the security gates. (1) Choose a gate with a blue sign. 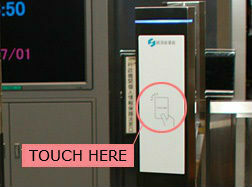 (2) Hold the visitor card over the scanner with the "TOUCH HERE" sign, as below. Enter the gate, after hearing the "beep". 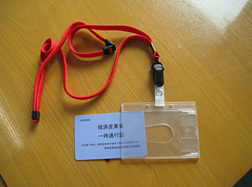 (1) Remove the visitor card from the holder. (2) Drop the holder in one of the plastic boxes beside the gates. 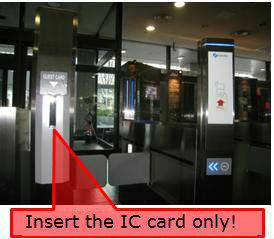 (3) Pass through the gate after inserting the IC card into the "GUEST CARD" slot.